There’s almost nothing more Israeli than a pan of Shakshuka. It is bold, it mixes some things that wouldn’t usually go together in a marvelous way, you eat it directly from a pan with a piece of bread regardless of how messy it might seem, and it has a presence – the burn on your tongue, smell of garlic and full stomach afterwards will remind you that the Shakshuka you had for lunch is here to stay. So what Shakshuka basically is? We are speaking about a pan with spicy tomato sauce with a strong note of garlic, and an egg swimming in the middle, as a delicate contrast to the aggressive sauce and sizzling pan. No egg here of course. The immediate suspect while trying to replace the egg is chickpea flour, but in that sense you need something that will keep the mixture softer, so it will go well while trying to eat it with a piece of bread right out of the pan. So I found the perfect mixture – chickpea and tapioca. The ‘egg’ mixture consists of 2 full spoons of chickpea flour, 1 full spoon of tapioca flour. Same volume of water, maybe a tiny bit more, and 1/2 tsp baking powder. Mix it well until you have no lumps and go for the sauce. The Sauce: In a pan, heat olive oil, cumin, paprika and chilies (either dried powder or fresh and finely sliced) until you have a mild sizzle. Be careful not to over heat that, because then the garlic will burn and turn bitter and the chilies will turn your kitchen into a mace chamber. 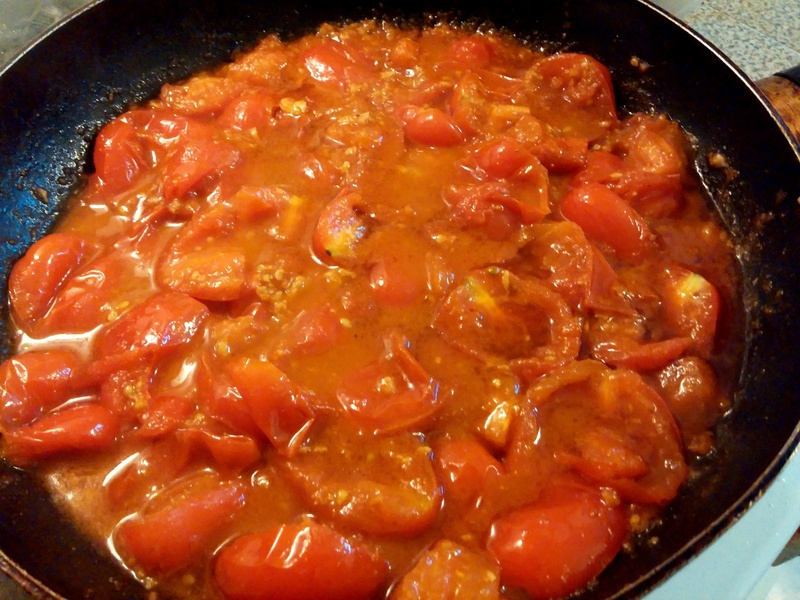 While everything is sizzling mildly, add some diced tomatoes. They should be red and tasteful. Hard tasteless tomatoes, the common kind you often get in a supermarket, are not the right thing for this sauce. 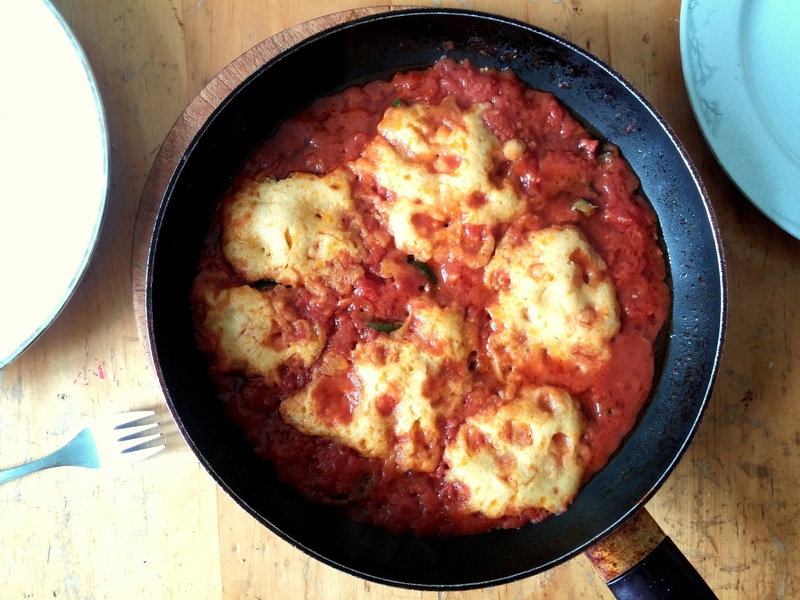 In this case it might be better to use canned tomatoes, preferably Italian. Then, mix with the seasoned oil, increase the flame and cover. If you want it to go faster, add salt to help the tomatoes release liquids faster. 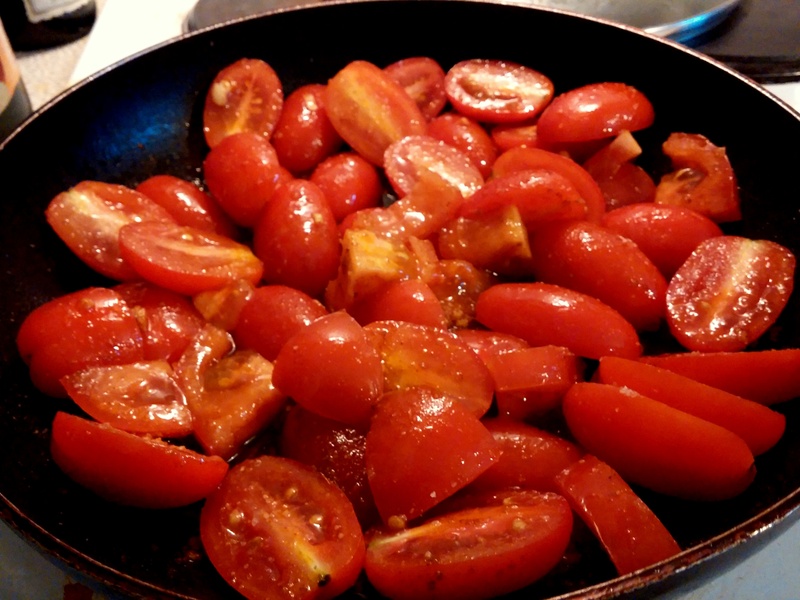 While the tomatoes get soft, feel free to help them dissolve faster, using a wooden spoon. When a sauce is present, and it is thick and bubbling, make some space with a wooden spoon and pour some of the ‘egg’ mix in different spots. Then cover and keep on cooking for some minutes. Check every 2 minutes to see if the top of the mixture is stable. I doesn’t have to be too hard. Then, remove the lid, and have another minute on a high flame so the sauce will be reduced. Serve to the table inside the pan, eat with some bread right our of it. Yes, even if you are several people. Enjoy! Posted in Starters, SubstitutesTagged Chili, Egg-free eggs, Garlic, Israeli food, Tomatoes, VeganBookmark the permalink. Looks great! But it only says how many chickpea/tapioca flour we need. But what about the rest? Hi Mochan and thanks for the reply. As for the rest – some of the amounts, such as how much garlic or chilies one should add – are up to your taste. 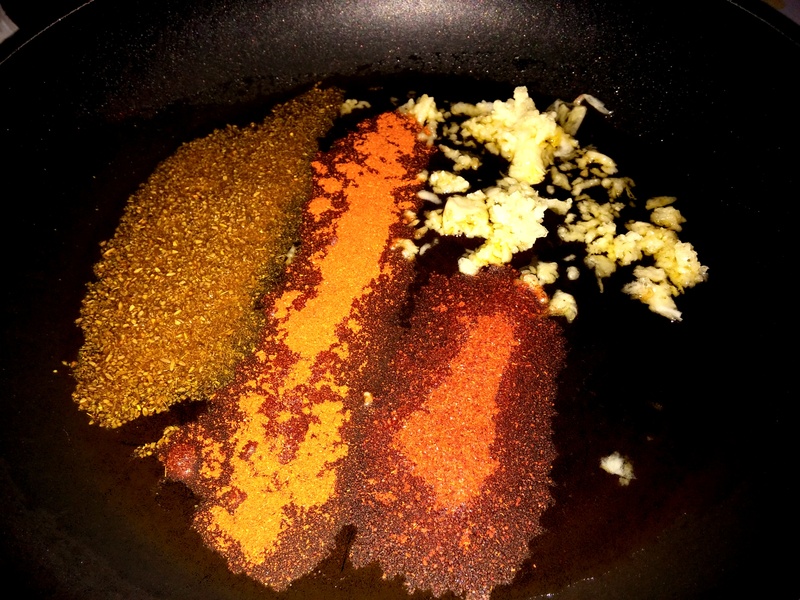 For a medium pan I use 3-4 cloves of garlic, 1 tsp cumin and two large and quite spicy jalapenos. As for the tomatoes, it depends on the size of the pan, they should cover the pan but to have the space to all touch the metal. For the pan in the picture, I used 250 g of cherry tomatoes plus one medium tomato, or in case you use canned tomatoes – one regular tin can. Yet, this recipe is more about the processes that should be done correctly while amounts could be more intuitive. Thanks for the fast reply, I’ll try this recipe soon! I am an Israeli vegan living abroad at the moment (Sydney). I also miss eggs so I was very happy to see this recipe using gram flour. All of your recipes look like my kind of food. I am looking forward to trying them. Glad to see someone finally try this! Looks delicious.